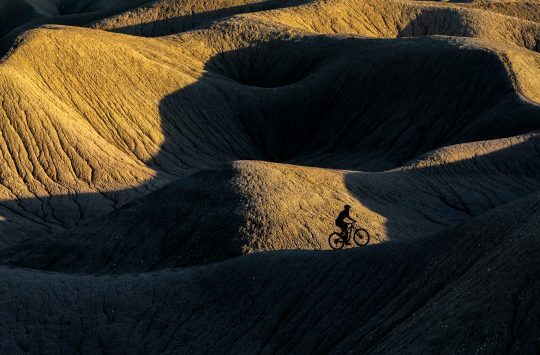 With four casing options, six different tread patterns, and numerous widths and diameters available – not to mention the four fat bike tyres it offers – the Bontrager mountain bike tyre range is about as niche-filling as it gets. Thankfully its mountain bike tyre line is nice and easy to understand. Firstly, there are three main casing styles. You’ve got G for Gravity, SE for Super Enduro, and XR for XC/Trail. From there, the number refers to the level of gnarness of the tread pattern. 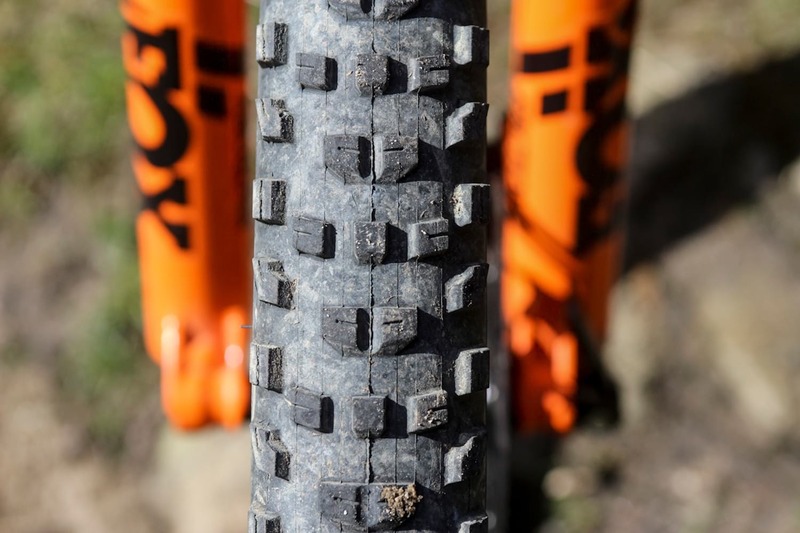 So the XR1 represents the lightest and fastest XC tread pattern Bontrager offers, and the G5 has the chunkiest and most aggressive tread pattern for downhill hoofing. 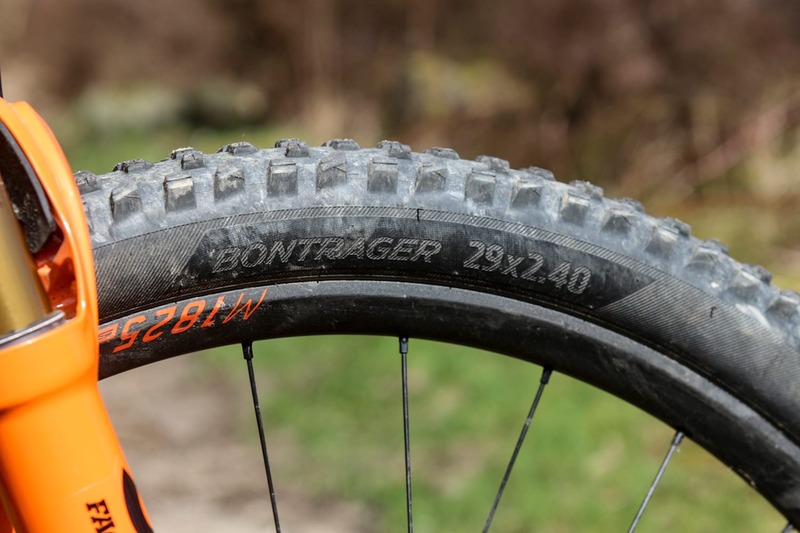 I’ve had good experience with most of Bontrager’s recent tyre offerings, including the latest XR2, XR4, XR5, SE3 and SE4. The SE4 here uses exactly the same tread pattern as the XR4, so it’s also designed for loose and rocky conditions. However, this one comes with a different rubber compound and a reinforced casing, making it a heavier and burlier option for trail riding and enduro racing. The SE4 was born to ride on the rocks. Photo: James Vincent. For the past 12 months, I’ve been testing the SE4 in a 29×2.4in size. The same tyre is also available in 2.6in and 2.8in widths, and in a 27.5in diameter too. 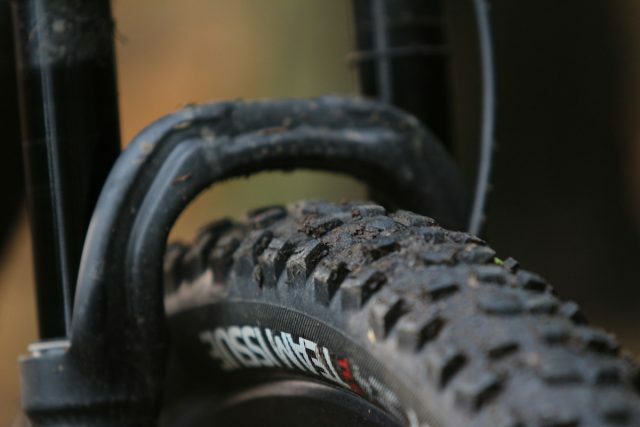 We initially received three pairs of SE4 tyres to use for the three bikes we featured in last year’s modern geometry 29er group test, though I’ve since dished out the tyres to several testers to amass some additional feedback. As such, the tyres have been tested across a wide range of trail conditions and on numerous bikes from lightweight carbon hardtails, through to 150mm travel enduro race bikes. It uses the same tread as the XR4, but the ‘Super Enduro’ version gets softer rubber and a tougher casing. Compared to the XR4, the biggest difference with the SE4 is the reinforced casing. 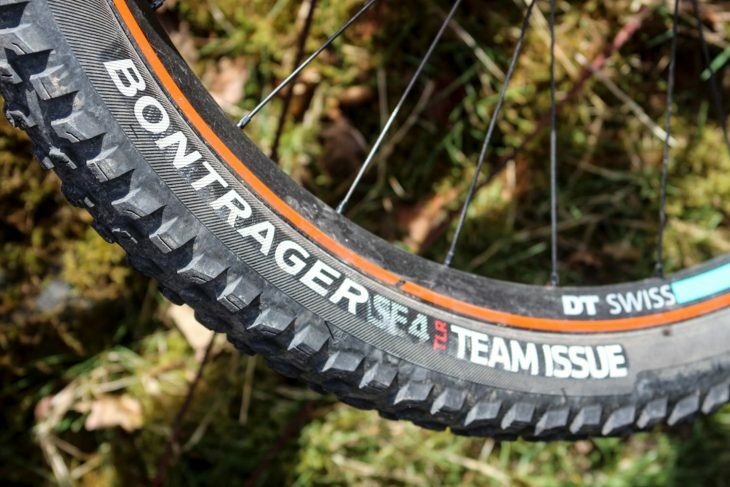 Bontrager calls it the ‘Core Strength’ casing, and it’s made up of reinforced sidewalls, along with a strip of protection that lies underneath the tyre’s tread. Unlike other tyre brands that will use this reinforcing layer from bead-to-bead, Bontrager has engineered this split design in order to create a sort of ‘hinge’ at each corner of the tyre. Why do that? 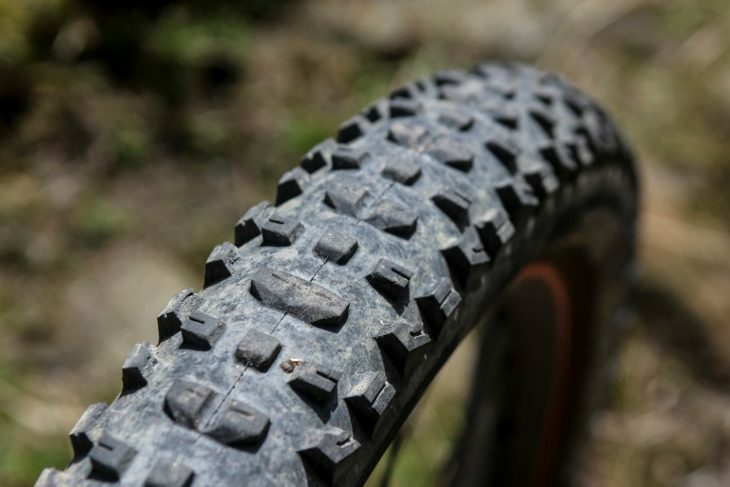 Some reinforced casings can be plenty strong and puncture-resistant, but they also can end up being overly stiff and uncompliant to ride, which reduces comfort and traction. The Core Strength casing aims to get around this by improving flexibility and the tyre’s ability to deform and mould over obstacles on the trail. 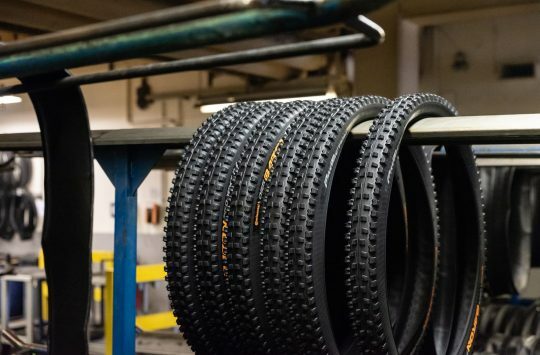 The SE4s have been setup on a huge variety of different rims, and thanks to the thick tubeless beads and robust sidewalls, they’ve sealed up tubeless every time with a regular floor pump. There’s been no need for a compressor or a funky tubeless inflator at any point during their lifespan. We’ve been testing the 2.4in version, though the SE4 is available in 2.6in and 2.8in widths too. Tested on rims varying from 22mm to 30mm wide internally, these tyres have been paired up to wheels including DT Swiss XR 1501 & M1825, Race Face ARC 27 & 30, Reynolds Carbon Enduro 29, American Classic 3430, and Santa Cruz Reserve Carbon. Regardless of the rim, fitment has never issue an issue with these tyres, which is nice. I currently have a set of SE4 tyres strapped to a 2018 Scott Genius 900 Tuned test bike, which features 30mm wide DT Swiss rims. On these hoops with 20psi inside, the Bontrager tyres measure up very close to their stated width at 2.37in (60.3mm). They have a good amount of volume and a nicely rounded profile, with no obvious shoulder or square edges. That said, I reckon this is probably the widest rim you’d want to slap them on. Go much wider than 30mm, and the sidewalls will start to bulge out beyond the cornering tread, which is not good. On skinnier rims, the SE4 gives a more rounded profile and a springy ride quality. They’re a bit heavy for XC racing, but even on a lightweight hardtail the SE4 is a terrifically versatile tyre. Even aired up at pressures as low as 18psi on the front and 20psi on the rear, the SE4 carcass holds its shape well. 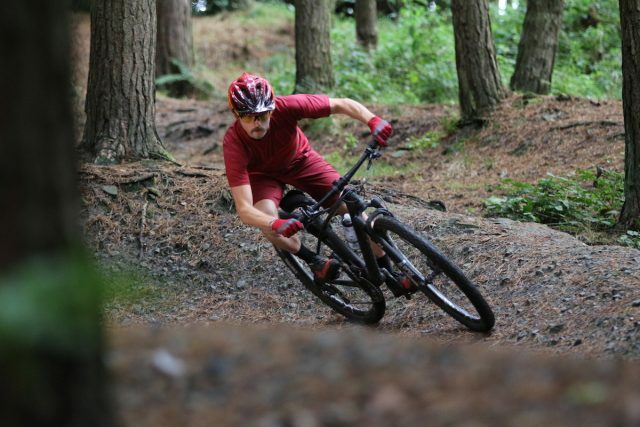 It doesn’t fold or tuck when being pressed hard into built-up berms or lips, and the rounded profile also gives it a smooth and easy-to-lean feel. Despite the stability of the Core Strength casing, as advertised, the SE4 isn’t a dead-feeling tyre in normal trail scenarios. This was particularly noticeable when they were fitted to a lightweight Canyon hardtail, where the SE4s felt plenty springy. 30mm is likely the limit for rim width with the 2.4in wide SE4. Nearly all the tread blocks are siped to increase grip. Predictability is also present in the SE4s traction levels, where the consistently-sized tread blocks deliver few surprises. The tread design is made up of a centre row with a repeating pattern of two ramped blocks followed by a line of three blocks – the outside of which are flared up slightly to provide a grippy transition out towards the shoulder tread. With the exception of the smallest centre tread blocks, every one is siped for more flexibility and grip. The centre tread is siped horizontally to increase braking and climbing traction, while the edging blocks are siped vertically to help them pinch the ground during cornering. The result is a fast-rolling tyre that gives more traction than it initially appears to. 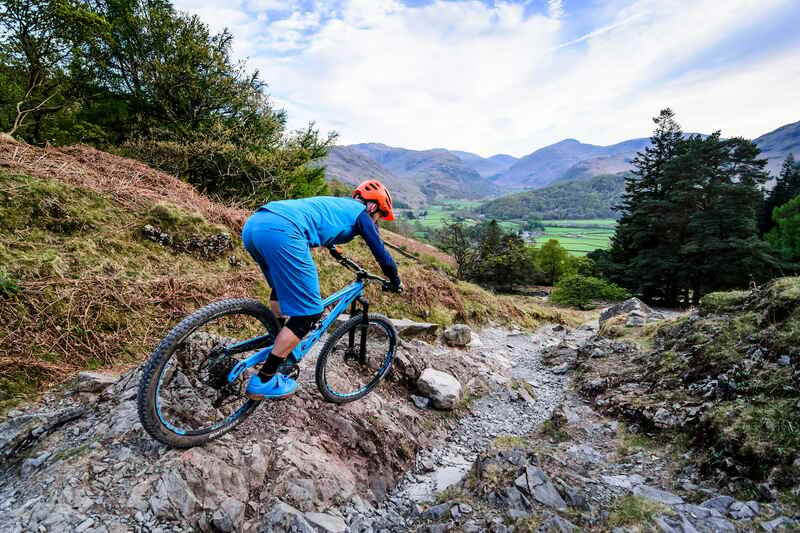 It’s a terrifically versatile tyre, with a good feel on hardpack trails, and plenty of bite on loose and rocky trail surfaces. 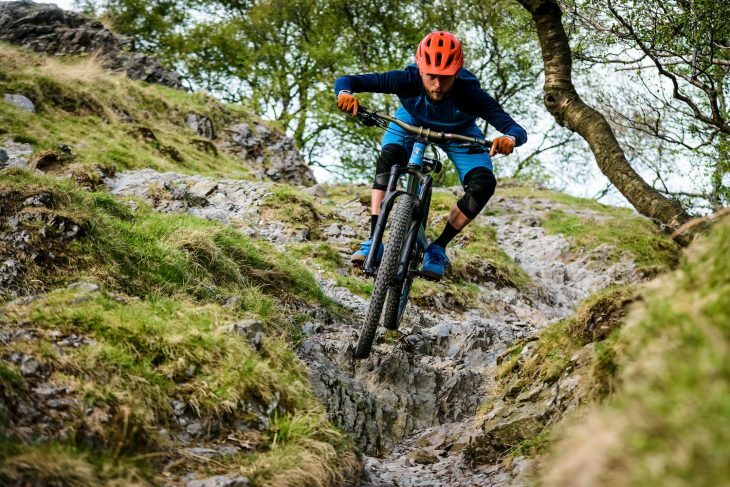 It handles the softer and grittier soil around Calder Valley without fuss, and during trips up to the Lake District, the SE4 has been thoroughly reliable for skating across loose granite and slate-covered singletrack. Testing the SE4s on the rocky trails in the Lake District. Photo: James Vincent. It’s also much better than expected in the mud, despite the relatively shallow knob height. This is likely due to the amount of open space present in the tread pattern, so mud has less opportunity to cling to the surface. In many instances over the winter months, I’d open up my eyes to find I hadn’t slid out and flipped over the bars. However, once in gloopier stuff, the short tread blocks struggle to break through softer top layers to firmer ground underneath. Likewise, I’ve found the edging blocks aren’t toothy enough to latch on to looser surfaces when loading up the front end on really steep descents. This was apparent during a trip over to Italy to ride some very technical trails in Molini. The SE4s for the most part were faultless, but on some of the steep and off-camber corners where the trail surface was loose and eroded, I was wishing for a tyre with more robust cornering tread – something like you’d find on a Maxxis Minion DHF, a Schwalbe Magic Mary or Bontrager’s own SE5 tyre. In fact, for enduro racing or just riding big travel bikes on steep stuff, that’s exactly the combo I’d go for; an SE5 on the front and an SE4 on the back. There’s some signs of wear on the cornering tread out back. Despite all the miles our test tyres have seen over the past 12 months, they’ve been absolutely bulletproof during that time. 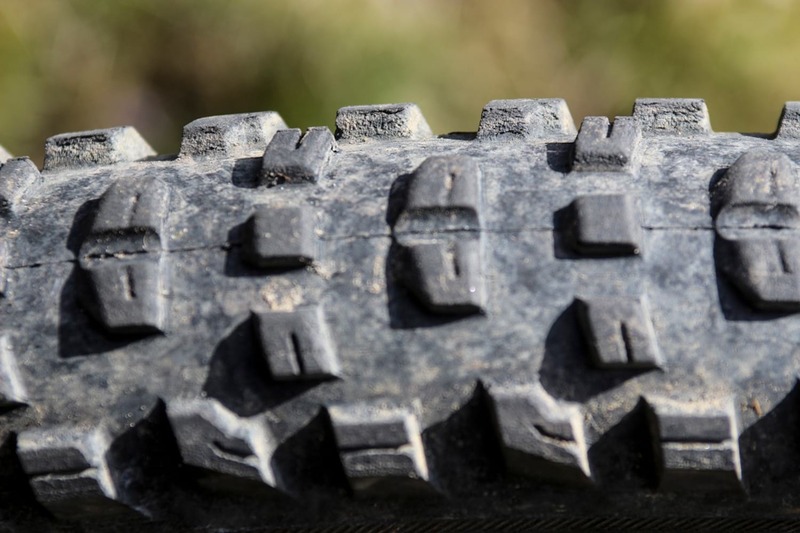 No rider has managed to puncture or cut one, and while the cornering tread is starting to show signs of wear on some of the rear tyres, no knobs have been taken by the trail. Given their durability and predictably sticky feel, the SE4s are easily one of the best do-it-all trail tyres that I’ve used in the past year. 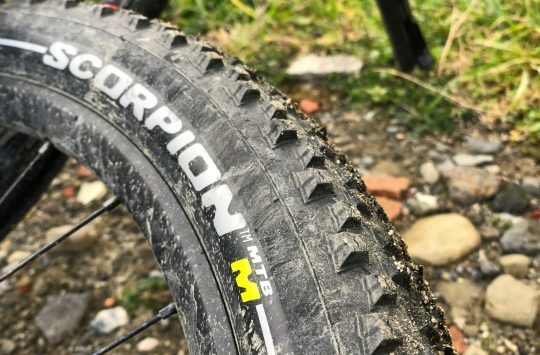 They’re priced higher than the equivalent XR4 tyre, but the softer rubber compound and tough Core Strength casing makes it well worth it in my book – particularly if you’re riding rocky trails. Unless you’re enduro racing where you’d want a burlier tyre (such as the SE5), this is a great tyre that you can slap onto the bike for most months of the year without need for swapping to different rail conditions. Been running this on the rear of my G150 for the the last year. Perfect all rounder. Looking rather sorry after Finale, with a couple of knobs missing bits. But no punctures or cuts despite vicious trails. Roll well, brake OK. Wouldn’t fancy them up front for this sort of bike though. I’ve been a fan of the Bontrager tyres for some time now, and have always run them tubeless. Any news on when 29 x 3.0 versions will be available? Marked as ‘pre-order now’ or whatever on the Trek website, but no dates.